This article is a collection of frequently asked questions and useful tips about two-factor authentication and U2F. If you need help enabling or using two-factor authentication, you will find our complete step-by-step guide on the matter here. If you need help managing U2F security keys in your Dashlane account, please click here. Should you experience any technical issue or receive an error message when attempting to add or use a U2F security key with your Dashlane account, you can always contact our Support team. If your YubiKey does not work with Dashlane or any other service and you believe it may be damaged, please feel free to reach out to Yubico's support team. If I enable two-factor authentication, will Dashlane still send me security codes via e-mail to authorize new devices? No. Two-factor authentication overrides our standard authentication system which works by e-mail. This means that you will stop receiving security codes that are sent by e-mail. Using this advanced authentication system, you need to use your U2F security key if added to your account, or the entry named Dashlane in your two-factor authentication app on your phone. Can I delete the Dashlane entry created in my two-factor authentication app? When two-factor authentication is enabled, it will create a special link between your Dashlane account and your mobile device thanks to the two-factor authentication app. Always keep the two-factor authentication app on your phone or tablet. Do not delete the entry that Dashlane created in the app, as the entry cannot be restored if you get a new phone or moved to a different device, and you need it this entry to get new codes each time it is required. If you plan on changing your mobile device or restore it to factory settings, please disable two-factor authentication from your Dashlane account before doing so. 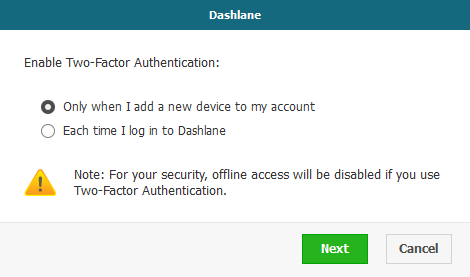 Do I need internet access to authenticate my Dashlane account via two-factor authentication? You will need internet access to open your Dashlane account when two-factor authentication has been enabled and each time you are required to authenticate with this second factor - security code or U2F Secret Key. This is for security reasons. If your device is already authorized and if you did not choose to authenticate with two-factor authentication each time you sign in to Dashlane, you can perfectly access your account offline. Please note that you can generate the authentication codes without having internet access on your mobile device itself, which is useful when traveling. Should I enable two-factor authentication if I disabled Sync in my account preferences? If you disabled Sync in your account Preferences, activating two-factor authentication means losing all data on all your other devices. Be sure to check that you have absolutely all your data on this computer and then activate it from there. When it has been activated, you may need to re-authenticate all your other devices depending on your settings. Can I freely switch between two-factor authentication security levels? For security reasons, this is not something that we do for now. If you wish to switch between two-factor authentication security levels, you will have to first disable two-factor authentication for your account, and enable it again. More information on that here. In a nutshell, U2F can be seen as an extra layer of convenience and security for your Dashlane account. Real-time challenge-response schemes like U2F address OTP vulnerabilities such as phishing and various forms of man-in-the-middle attacks. If you would like to find more information on the benefits of using a U2F security key - and U2F in general - instead of OTP, we would suggest you to read our Beginner's Guide to Using Two-Factor Authentication and U2F to Secure Your Passwords, as well as this article from Yubico's website. Please note that some security keys are actually compatible with both OTP and U2F, such as Yubico's YubiKey 4 and YubiKey Neo. If you do use one of these security keys, and if you are planning to add it to your Dashlane account for its U2F function, we strongly recommend that you do not not use its OTP function as well to replace your mobile authenticator. This is because if you lose your U2F security key, we will allow you to authenticate with your mobile authenticator as a fallback method - which would be impossible for you to do if your security key was not only used for U2F, but also to replace your mobile authenticator. What security key should I purchase? You can purchase a U2F security key from Yubico's website. Here are the models that are U2F-compatible: YubiKey Neo, YubiKey 4 Nano, YubiKey 4, FIDO U2F Security Key, YubiKey Neo-N, YubiKey Edge and YubiKey Edge-N.
Is my U2F security key a biometric device? Depending on the model that you use, you may need to tap the button or gold disk present on the top of the key for activation – this is the case with for YubiKeys, for example. However, U2F security keys are not a biometric device: a tap on these security keys simply provides a small electrical charge that activates the key. Do I need a Premium account to use two-factor authentication via U2F? While two-factor authentication can be enabled on all Dashlane accounts from Windows and Mac OS X devices provided that at least Dashlane 2.0 is installed, two-factor authentication via U2F is a Premium feature only. It means that you will only be able to add a U2F security key to your Dashlane account if you have a Premium subscription. Pre-2.0 status and Premium trials do not unlock our U2F feature. Can I use my U2F security key with Dashlane on mobile devices? Mobile authentication can be done through the NFC contactless technology supported on some U2F security keys, for instance the YubiKey NEO. This only works with some Android and other devices. However, please note that Dashlane is not currently compatible with NFC technology. Only some security keys can be used with older series of iOS devices. Please refer to Yubico's support for more information. However, this is not yet supported by Dashlane. How many U2F security keys can I add to my Dashlane account? You can add up to 20 U2F security keys to a Dashlane account. If you add several keys to your Dashlane account, you will be able to authenticate yourself using any of these keys. I have one U2F security key. How many Dashlane accounts can I add this key to? A U2F security key can be added to an unlimited number of Dashlane accounts. Can I disable two-factor authentication using my U2F security key? No. Two-factor authentication can only be disabled in Dashlane with codes generated by your two-factor authentication application. More information here. My U2F security key has no button or gold disk. How should I use it to authenticate myself? Whenever Dashlane will ask you to plug in your U2F security key – either to add the key to your Dashlane account or to sign in to the app - you will simply need to plug the key in to your USB port, and that's it. Only security keys with a button or gold disk will require a little tap for the authentication to be completed. Please note that while your security key with a button or gold disk can simply stay plugged in to your computer at all times, if your security key model has no button or gold disk, you will have to actually unplug and plug it back in to the USB port to complete the authentication. Can I plug multiple U2F security keys to my computer simultaneously? If multiple U2F security keys are plugged in to your computer, Dashlane will only allow authentication via the key that was plugged in first. This is for security reasons. After plugging in my U2F security key, I received an error "Key not found". What does it mean? This means that the U2F security key that you plugged in has never been added to your Dashlane account. If you have multiple keys, please try another key. Dashlane is asking me to plug my U2F security key in for authentication. The key is plugged in, but nothing happens. Why? U2F security keys with a button or gold disk will require a little tap for the authentication to be completed. Please refer to the video at the top of the page here for more information. If your U2F security keys has no button or gold disk, you will have to actually unplug and plug it back in to the USB port whenever authentication is required. Do I need to keep my U2F security key plugged in at all times? No. You only need to insert your U2F security key when adding it to your Dashlane account and when signing in from a new device / signing in to your Dashlane account (this is based on the safety level you chose when you enabled two-factor authentication). However, you can keep your key plugged in at all times. Please note that if you do, and if your security key has no button or gold disk to tap on during authentication, you will have to plug it out and in again when signing in. Why isn’t U2F implemented in more large scale services? One reason is that the Chrome browser is the only available client to support U2F. Firefox will hopefully support this shortly and more browsers will likely add this feature, which will make U2F available to the vast majority of internet users. Also, it takes time to drive new global standards. For more information, visit Yubico's website. What if I lost the device I used to set up Two-Factor Authentication? Can a Dashlane employee access my data?